You are here: Home / Indoor! What is the most commonly used room in your home? It’s probably the living room. It’s where the whole family comes together, where visitors sit and enjoy conversations and where memories are made. We’ve already shared houseplants for your kitchen and bedroom; now let’s focus on the living room. Houseplants differ in needs of light, space and water. So we are outlining the perfect houseplants to add to a medium or brightly lit living room. Head to your local garden center to pick any of these beauties up. And don’t forget to grab some Indoor! liquid fertilizer to give your plants a boost. This easy to grow succulent adds dimension and design to any space. As the string of pearls gently cascade down the container, it resembles jewelry hanging off of a shelf. You can’t go wrong with this classic plant. It grows best in bright light. 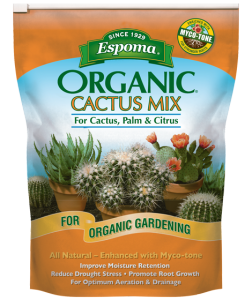 Make sure you feed regularly with Espoma Organic’s Cactus! liquid fertilizer. This heart-leafed plant will inspire anyone who comes in contact with it. It has gained popularity due to it’s big, angular leaves. It is easy to grow and will tell you when it needs a little bit of love through it’s slightly dropping leaves. Philodendrons prefer bright, indirect light. Aptly named for foliage that look like miniature umbrellas, this tree is the perfect addition to your home. This tree needs bright, indirect light – if they do not receive enough light, they can get leggy, so be sure to keep an eye on it to ensure it is getting the light it needs. Learn more about dealing with leggy plants. Don’t be intimidated by a tree this size. Get a young rubber tree and train it to any size you want. Caring for this tree is simple – put it in bright, indirect light so it doesn’t over heat. Enjoy the oversized foliage, and a few compliments from visitors. This antler-like foliage will be the conversation starter you were looking for. Mount this fern on any wall or place it in a basket to really show off it’s beauty. This fern does well in low-to-medium light, so it will be happy anywhere you place it. Learn how to fertilize these houseplants from Homestead Brooklyn. https://www.espoma.com/wp-content/uploads/2018/11/espoma-organic-logo.png 0 0 espoma https://www.espoma.com/wp-content/uploads/2018/11/espoma-organic-logo.png espoma2019-01-10 10:47:482019-01-17 11:32:40Indoor!